What do we see? What do we pay attention to? While I have always enjoyed photography, in 2013 I began an active practice of looking for beauty in my daily life, focusing on the natural world. By paying attention and documenting that beauty, I have been learning to appreciate the wonder of the world. Whether at home or traveling, I carry my camera and make it a point to take at least one photo a day. As my photography developed, I also began to look for ways to play with light, using long exposures to create an image as well as capture it. This led to an interest in lightpainting and astrophotography, as well as a greater understanding of photography and light! 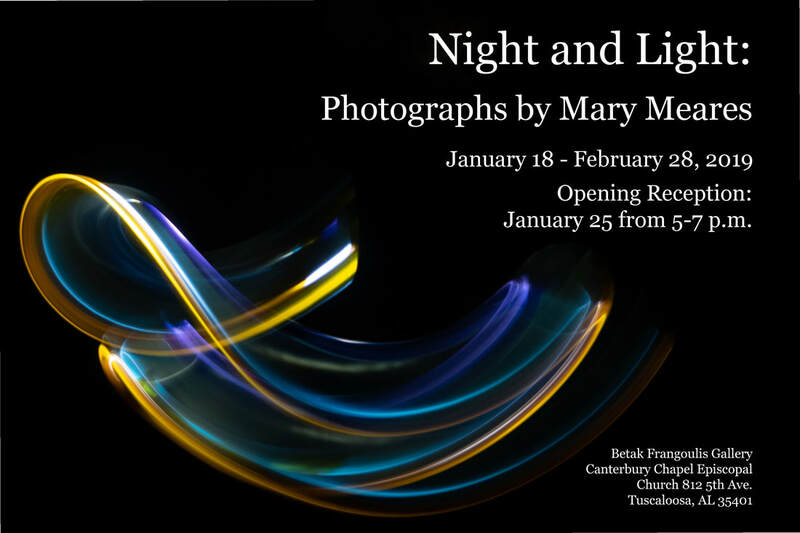 "Night and Light: Photographs by Mary Meares" at Betak Frangoulis Gallery at Canterbury Chapel Episcopal Church in Tuscaloosa, AL, January 16-February 28. ​This exhibit included lightpainting and other long exposure photos. ​"Rest in Peace," a show of graveyard photos was displayed at the "most haunted house in Alabama" -- the Historic Drish House in Tuscaloosa, AL. "Travels Near and Far: Photography by Mary Meares" was at the Dinah Washington Cultural Arts Center from September 2-30. Two of my photos were competitively selected, one winning an "Award for Excellence," for the Double Exposure Photograph Show at the Dinah Washington Cultural Arts Center (January - February). My photo, "Rain," won the Purchase Award, Adult Division (top prize) in the 2015 Double Exposure Alabama Photography Show. It is on permanent display at the Bama Theater in Tuscaloosa, AL. Two photos were accepted for the 2015 West Alabama Juried Show, one double exposure and one flower photo. 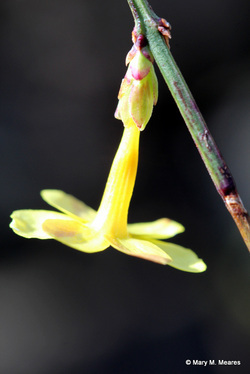 "Anticipating Spring": My nature photos were on display at the back wall of Five Java, in Tuscaloosa, AL. Three of my photos were competitively selected and included in the 2014 West Alabama Juried Art Show. Two of my photos were competitively selected and included in the 2014 Double Exposure Alabama Photography Show at the Bama Theater in January and February, 2014. In my first competitive show, three of my photos were competitively selected for the 2013 West Alabama Juried Art Show. Pick something. The sky. A person you love. A category of objects like fruit or flowers or trees or rocks or water. For 30 days, take a picture every day of that thing or person. Notice how much more you see at the end than you did at the start. Notice how, when you feel like there is no new angle or way to take that photograph, you find new insight. Play. Enjoy. Experiment. Reflect. Learn! Join the T-Town Photography Club!